After a strong finish the the first half of the NBA season, it hasn’t been the easiest week back to work for the Wizards. First a loss against the Sixers in Philly and tonight a disappointing effort against the Jazz, leaves some wondering what happened to the team chemistry. The Wizards lost, 102-92, to Utah and for the second game in a row stumbled into a double-digit deficit they could not battle out of. The depth reached 24 points inside Verizon Center, and although a lineup of four starters along with Bojan Bogdanovic stirred the crowd of 19,648 with a late comeback, the effort came too late. To top off the poor performance by the Wizards, Markieff Morris was ejected in the fourth quarter for throwing the ball into the stands following his sixth foul. 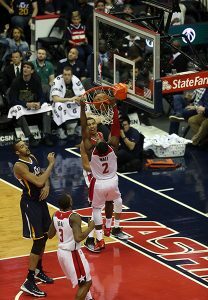 Wall, meanwhile, picked up his 11th technical foul of the season late in the second when he felt he was fouled on a layup attempt that Rudy Gobert swatted out of bounds. Wall spun around to yell at official Eric Dalen, and the complaint earned Wall an immediate punishment. “We just have a few guys who were frustrated at the officiating today,” said Brooks. Along with the poor output on the court, it didn’t seem to help too much tonight. The Wizards have tough match-up come Tuesday night when they face the Warriors at home before heading out on road trip against several tough Western Conference opponents.